One of my mom's friends died recently. She was someone I appreciated even tough I did not know her that well, I remember she was always smiling and laughing and she lifted my spirits with her happiness. She was a single mom but hardship never affected her good spirit. I liked having her having around. After the the funeral service, her daughter visited my mom's house to invite her to a group prayer for her mom. She was, as you would expect, very sad and down because her mother died. But as soon as she walked in my mom's house, her face changed. My mom has a huge print of "All You Need Is Love" in her living room and the girl's face changed as soon as she saw the painting. She turned out to be a big fan of my work, and meeting someone who had my art in her house made her forget for a moment the difficult time she was going trough. They talked about my work, how she likes my paintings and when she asked mom if she knew me and mom said yes, she knows me (After all, she's my mom) the girl was exited and happy. Sometimes I feel totally down and that my art is unimportant. But when I hear stories like that, where my work has changed someone's life for the better, even for an instant, it makes every sleepless night worth it. I'm into art in to share beautiful things that live in my mind. Every painting is like a kite I lift to the sky, careful tethering it until it touches the clouds. And when the moment is right, I let the cord go, so it can fly and soar on it's own and let it be caught on someone Else's hands to give it a new meaning, a new beginning. That's why I am an artist. And it makes me immensely happy. You are such a beautiful artist...heart and soul! This is a wonderful post of how art truly makes a difference in such unexpected ways!! Art can truly make the heart sing!! 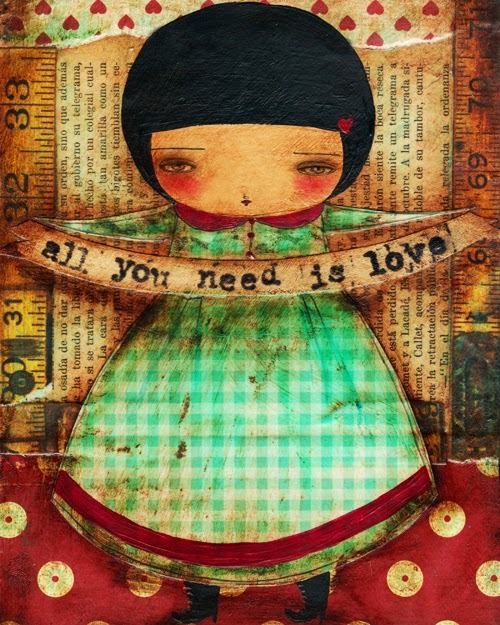 Yours is beautiful...and "All you need is love" is my favorite line of all time!! I have your Alice in Wonderland ATC series framed and hanging in my guest bathroom. Everyone who has used that room has made comments on how happy it made them to see that art. You have a gift the rest of us strive for! Please ALWAYS be an artist! Beautiful story and I am so thankful I am able to hear your voice, see you create and learn from you. Thank you for being you and sharing your heart with all of us. I just started a blog. I was browsing for some art blogs and yours was the first that I looked. And to see your post just took away all my doubts on whether to continue art..
Amazing. Just to be able to put a smile from something you can create. Best feeling. Hope one day I can do something like that. You and other artists make the world a beautiful and interesting place. My first art of 2014! And now it's time for a GIVEAWAY!